Commercial imagery of women leading other women is commonplace. Commercial Imagery of women leading men is rare, indeed, to date (2 October 2018) this is the only example I have found. 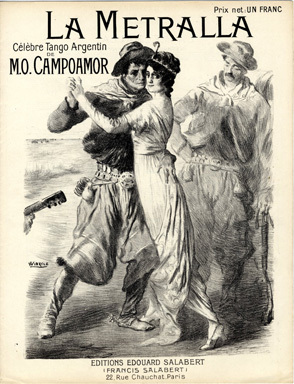 This is an illustration taken from French 1913 sheet music for the tango “La Metralla”, originally composed in 1902 by Uruguayan, Manuel Oscar Campoamor. It is an arrangement for piano. We can, perhaps, get a feel for the kind of story it might have been. “Metralla” can mean “shrapnel”, so some sort of confrontation seems likely, but can also means small change, as in metal coins. “Lighthearted and naughty”? Certainly, that is the feel of the jaunty Canaro recording, but without the story, we can only guess at what is supposed to be going on, at why she stares at the onlooker with such challenging directness. Flip the image on its vertical axis and everything become plain. The whip is then in the “normal” right hand, the guitar is conventionally held, the man is now leading the woman as “normal”, and the direct stare is only that of a woman challenging us to acknowledge her choice of partner, or to acknowledge her fate, if he was not her choice at all. The reversed image would have been the image the engraver would have seen on his plate. It is interesting, but unremarkable. 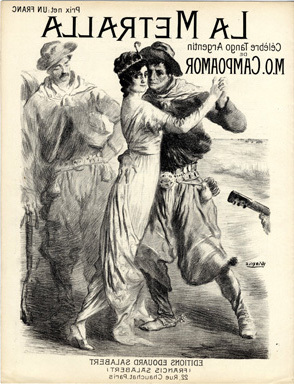 Did he really forget that in printing, everything – including the tango hold of the dancers – would be reversed? Perhaps he did. Yet his error leaves us with an image which, when it circulated in early 20th century Europe, may, unwittingly, have provoked all kinds of comments and discussions. The search, meanwhile, for an historical image that really does show a woman leading a man is not yet over.